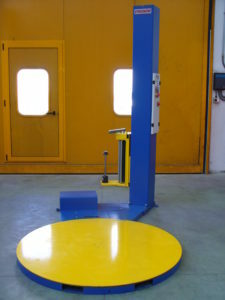 A simpel and basic wrapper, with various possebilities to setup programs and parameters, such as TOP wraps, BOTTOM wraps and speeds. 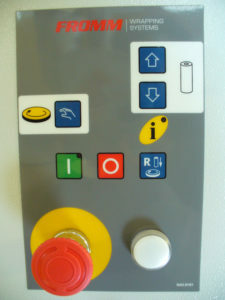 Ones the machine has been installed and programms have been setup, the operator simply pushes the start button and the machine will start the automatic process of wrapping. The parameters for programms are setup during the initial installment and can be changed on request. Semi-automatic Stretch Wrapping Machines with multiple wrapping programs and multiple unique FROMM Patents. FROMM stretch wrappers are extremely user-friendly and can be used in every situation. The FS31x, in particular, is highly suited to use by smaller-scale film users. Extra emphasis was placed during the design stage on safety and reliability. All the machines are designed to cope with a high workload. The use of carefully selected components keeps maintenance to a minimum. Operating panel ONE with fixed automatic program. L W H Max Kg.